A big part of healthy eating is planning ahead! I start back work next week and I want to be ready to go. A while back, I posted about 30 Days of Clean Eating! I definitely cleaned up my diet, but I wasn't very diligent in blogging about it. So, I think the beginning of the year is a great time to take on a new challenge! January 2nd - January 31st - I am going to be very deliberate in avoiding as many processed foods as possible. I will do my best to keep you updated throughout the month on my progress! 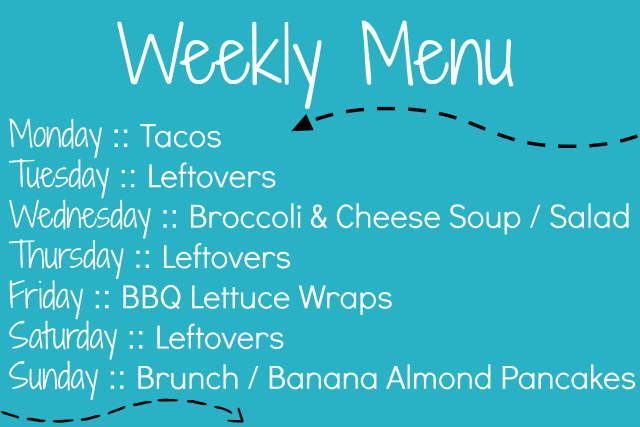 I'll also make sure to share my weekly menus with you! Tacos - just your typical tacos - but with homemade seasoning. Yum! I'll serve up some beans and fresh toppings. Check the labels on your taco shells! I use the hard shells from Trader Joe's. Broccoli & Cheese Soup - My husband has put in a request for this soup. All the ingredients in this recipe are clean - but I am going to try to lighten it up a little. I think I can get by without all the butter. There's also a great recipe on 100 Days of Real Food. I'll make a salad on the side. BBQ Lettuce Wraps - I LOVE these! They are so light because there are no buns. I am going to clean this recipe up a little by making my own homemade barbeque sauce. Banana Almond Pancakes - My family enjoys brunch for breakfast. These pancakes and some fruit will make a great spread.